What an exciting day! We just received some of our freshly designed Everyday Circle cards and we can’t wait to share them with the world! They are a brand new tool to help teachers who want to do this work but don’t know where to start. We have partnered with two other incredible organizations: Tribes and HEART to create Everyday Circles for teachers to implement SEL, restorative practices, humane education, and more. 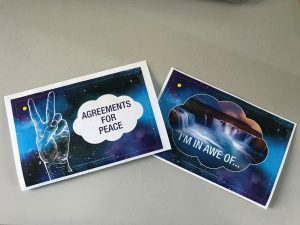 There are 180 cards in the deck and each card has everything you need to lead your group through these processes, including images, prompts, and directions for interactive fun. We have had this vision for quite a long time and the stars finally aligned for us to make this happen! We have long thought that the actual work we do isn’t all that complicated but the support that you need to begin and maintain it, often is. Usually, this is a function of the need to change our mindset and learn new ideas incrementally to have time to actually implement and adjust. All of this requires a lot of teacher training…a luxury many schools and teachers do not have. So, without a lot of access to teachers, we thought, how can they learn how to do the work at the same time as they are doing it? That is exactly what these cards are designed to do. If teachers can make a bit of time and commit to making the circle a daily practice, these cards will take you through how to do it. How do we ensure only one person speaks at once? How do I give students strategies for self-regulation? How can I use the circle to discuss serious issues troubling our group? How do I do all of this and still have fun and create positive relationships? All of those, and so much more is what we know these cards will offer. Now, the hard part: the waiting. We are working diligently to get all 180 of them designed, laid out and then printed! They will also be available in PDF form. Stay tuned- we will let you know just as soon as they are ready. This is an awesome article….couldn’t help myself…had to post it.